Published quarterly in English language. Annual cummulation also available on CD-ROM. 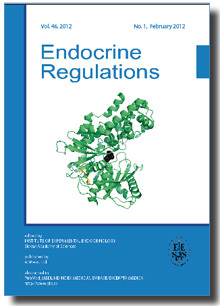 Endocrine Regulations (since 1967 to 1990 Endocrinologia Experimentalis) is an international journal devoted to publish outstanding original articles and reviews in experimental and clinical endocrinology. Manuscripts dealing with molecular and cellular endocrinology, neuroendocrinology/signal transduction, metabolism and diabetes, pharmacology, and genetic aspects of endocrinology will be considered. Endocrine Regulations has now moved to online submission and review system.